My current series—Le Cirque—explores the circus arts in Paris, in all its gravity-defying, sequin sparkling, theatrical splendor. I don’t remember, as a child, ever thinking I would run away and join the circus. But now, as an adult, the option remains open. The circus arts have become a siren’s song. I am mesmerized. This image is from the Cirque d’Hiver, one of the oldest circuses in Europe. The art nouveau building was created for Napoleon in 1852, and the circus inside became a favorite venue for the Paris elite, as well as a subject for the Impressionists. Now, during the winter, the show provides a journey into a magical yesteryear, ringmaster and all. 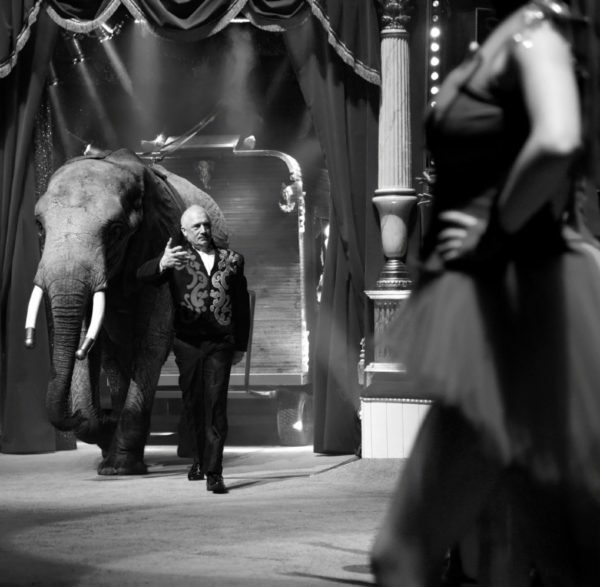 And, next year, the once-timeless traditions will change again, as the use of wild animals in circuses has been outlawed in Paris. Thus, this image is perhaps a last farewell to the mighty elephant… a memorable moment in their path to freedom. Meredith Mullins is an internationally exhibited fine art photographer and photojournalist currently living bi-continentally (in France and California). A traveler at heart, her work has been featured in more than 50 exhibitions throughout the world and is in museum and private collections in North America and Europe. She is the recipient of several international photography awards, including the Grand Concours Photo sur Paris, the Paris Prix de Photographie, the Worldwide Gala Awards, the Julia Margaret Cameron Awards, and the Photographers Forum Awards. Meredith has been a writer/photographer for National Geographic School Publishing, Paris Magazine, and Carmel Magazine and has been featured in publications including Camera Arts Magazine, Shadow and Light, Browntrout Calendars, and McGraw-Hill and Wadsworth books. She currently writes and photographs for publications in France and the U.S., teaches photography in Paris, and is the author of the award-winning photography book In A Paris Moment.